The profile we have chosen to feature today will delight single men looking for a classy lady for companionship in South West London. She lady is called Yvette, she has a very sunny outlook of life. Love Rock and Jazz music among other things. Please read her full dating profile below and make contact if she is you kind of woman. I’m a bubbly girl who is fun to be with, I have a great personality and sparkly blue eyes. I have my own car and house and I love my job. I’ve been through all life can throw at me but at my age who hasn’t. I love horses and being in the country or by the sea. missing cuddles laughter and companionship and being someone special once more. Some of my interests includes Pop Music, Rock Music, Movies, Dancing, Animals, The Outdoors, DIY/Crafts, Pubs/Clubs, Reading, TV/Radio and Internet. For you gentlemen out there, today we bring you the profile of a lovely lady from Cheshire called May, she is looking for friendship. She is in her 50s, would love to meet a man of about the same age for companionship and friendship. 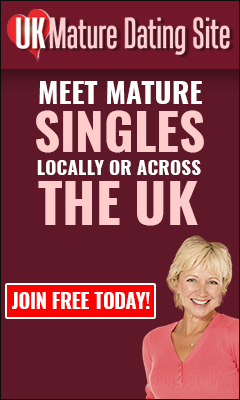 If you are not already a member of UK Mature Dating, you can join free of charge by clicking this link. More details about May below. I like to go for walks in the country that end up in a quiet country pub. I like watching sport especially F1, I am also a football fan and follow my favourite premier league team. Holidays in the sun are a must but also visiting historic places to imagine what life was like for those who lived there. I’m a keen ‘quizzer’ and attend a weekly exercise class. I’m looking to meet congenial individuals to share and relish what life has to offer! I am also interested in Pop Music, Classical Music, Rock Music, Movies, Theatre, Gardening, Restaurants, Pubs/Clubs, Reading, TV/Radio, Cooking, Travelling, Keep Fit and Sports (Watching).